Jeep pedal car plans print ready PDF free to download. 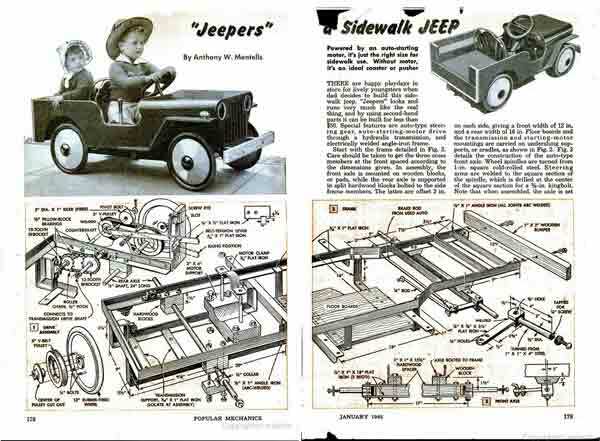 These Jeep pedal car plans featured in the January 1948 edition of Popular Mechanics. At the time you could make one for less than $50 using second hand parts. There is a fair amount of woodwork and metalwork that goes into the making of a project like this. Nothing beyond the determined handyman, but you could always ask a friend to make certain parts that may be beyond your skills, or if you simply don’t have the equipment for. This toy car is powered by a starter motor and using a war surplus hydraulic transmission. This is a project on my wish list. If I was to make one, I would use at least one if not two electric scooter motors on each of the rear wheels. It just so happens that I managed to salvage not one but two from the local dump – they both work perfectly. They were part of a pair of Razor branded electric scooters made for kids. Rated at 200kw and 2500 RPM unloaded they can be purchased from eBay for around $45. Suitable for people up to 70kg, speeds up to 15km/hr. If I could figure out how to power each rear wheel, it would be strong enough for me. Besides, the fact that they are independently powered may help with the differential effect. The steering mechanism uses a worm gear, which is great if you happen to have something like that. As it happens, I have a shaft and gear head from a whipper snipper, thought that might work. The steering wheel was made from 10 inch tricycle wheel with the spokes removed, and a 3/16 x 1 inch flat iron welded to the rim. Download vintage jeep pedal car plans, which includes detailed sketches and construction notes. More plans from vintage magazines includes a Jeep for a young GI and a Jeep for junior.